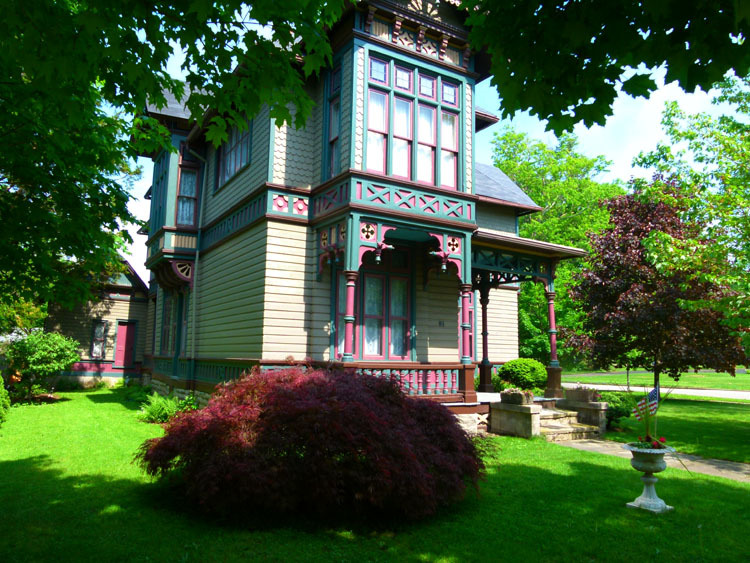 From Evangola State Park, we followed Lakeshore Drive (Highway 5) along Lake Erie as it wound its way around the shoreline past hundreds of seasonal holiday homes and villages. The road rose and fell but never steeply enough to stop us climbing. Down to the last couple of kilometres and the heavens opened up on us, fortunately, not for long as it stopped just as we reached the YWCA in town where we were staying. Just across the road was the town park and a farmer’s market was just winding up, probably a bit early because of the rain. We saw our first Amish people selling their produce at the market, they don’t half stand out! 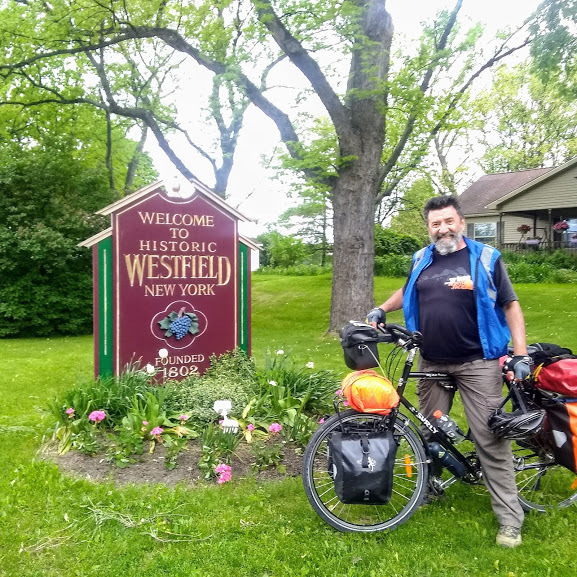 We stayed 2 nights in Westfield at the YWCA. On the last night I was looking through some tourist brochures I found in one of the drawers when an envelope fell out of one of them. On inspection, I found $140USD in $20 notes stuffed into it. Whoever had put it here had probably done it some time ago and probably forgotten about it. Why they’d hide it there, I had no idea. So we talked about it for a while and discussed what we should do with it. As it wasn’t ours, we had to figure out who we should give it to – a bit of a quandary! Since we’re great believers in Karma (what comes around, goes around), we contacted the Airbnb host who was running our room and told her about it. As she had no idea about it either, we decided to donate it to the YWCA and slipped it under the manager’s door the next morning on our way out. Karma has looked after us in the past, and we figured we had just earned some more “Brownie Points”. Heaven knows, we may need them before this trip is finished. There was an immediate improvement in the road surface as we crossed into Pennsylvania. A nice, new flat top greeted us, we were so happy and relieved. We began to ride past vineyards, an ominous sign, as we all know, grapes grow on the side of hills! The road along the lake remained relatively flat, but once you ventured away from the lake shore it climbed. As we got to Erie we could see we’d need a break before we started the climb up to our Warmshowers host. 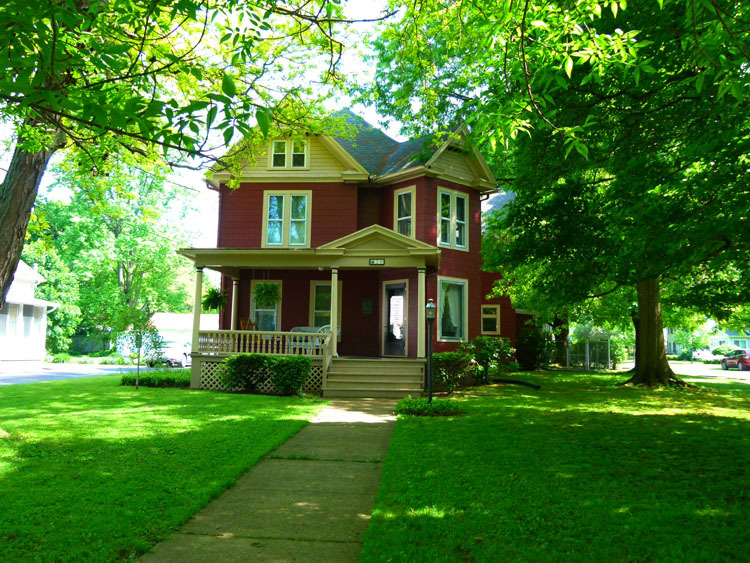 Unfortunately, our host, Leo, lives about 6 miles from the lake, most of it up Cherry Street, an enormously long and steep hill. So, being hot and tired, we had lunch in town and watched people as they made their way to the local baseball game across the street. Apparently, it was “Dollar Day” and everything cost one dollar, so the crowds were getting larger. I can’t say sitting around on bleachers all day, drinking dollar beers and getting roasted by the sun isn’t my cup of tea, but the faithful had turned up in numbers. The hill climb to Leo’s was a killer! It went up in 3 sections, so you always thought you were approaching the top, but actually, you had another hill to climb all over again. Leo’s house was worth it though. A nice big bedroom with a queen size bed and ensuite bathroom. Not only that, but once we were cleaned up, he presented us with a fridge full of beers! 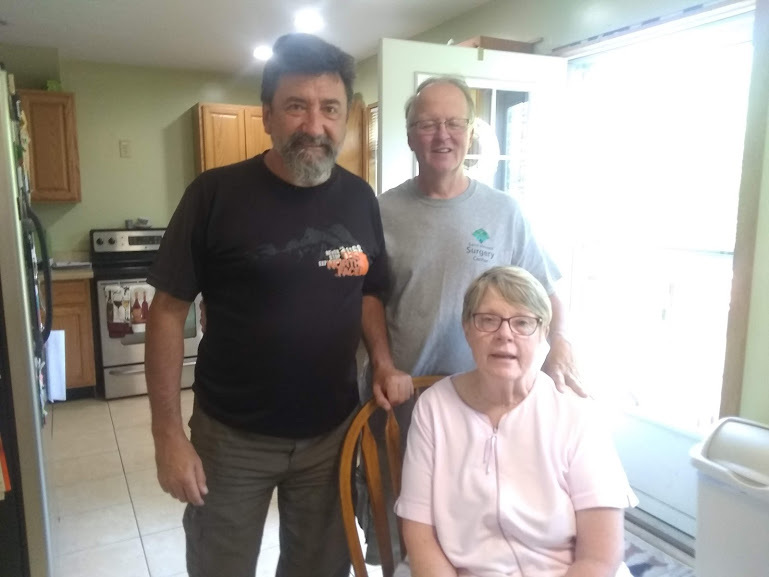 We met Bonnie, his partner of a few years, his brother who lives next door and listened to stories of his ride across America on the TransAm Route. No wonder he was so well set up for cyclists, he understood exactly what it was like to do a long distance, cross-country cycle tour. 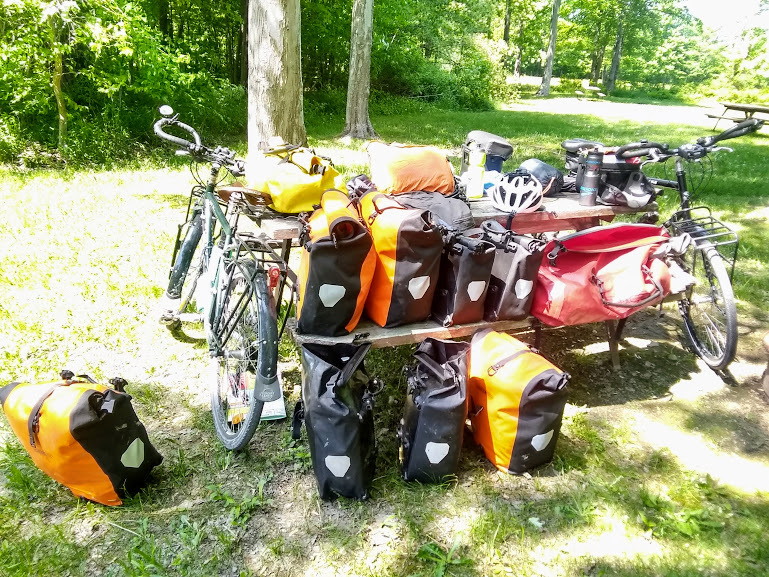 One of the great things about Warmshowers, apart from a place to stay FREE and a hot shower, is that the hosts are usually avid cyclists themselves and have great and up-to-date information about their own areas and places they have been recently. Leo was no exception. He advised us to forget the ACA route out of town and cycle Highway 20, a much busier road, but with a good shoulder, more direct and flatter than the ACA route. As it turned out, he was right, and we were soon rolling down the highway without that much traffic and were soon over the border and into Ohio, leaving the really nice Pennsylvania roads behind. It was back to rubbish roads! 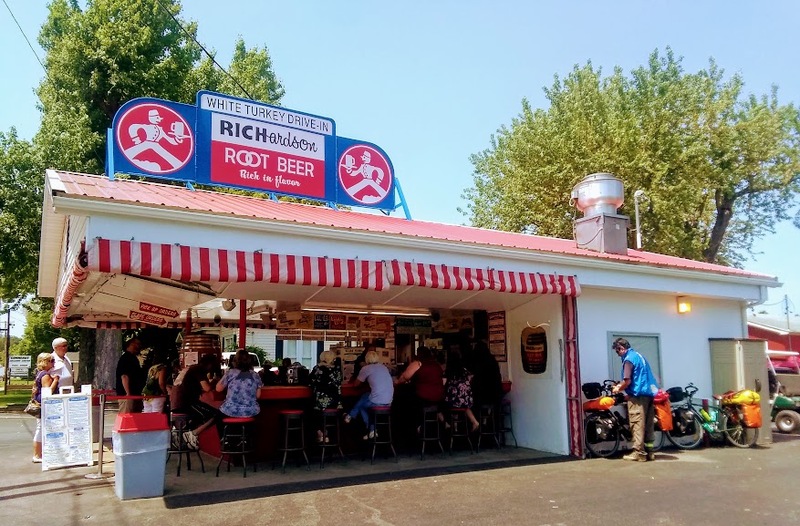 One other piece of advice Leo gave us was to call into a roadside diner called White Turkey, a kind of 50’s inspired open canteen that specialised in Root Beer Floats, otherwise known back in our hometown in Australia as Spiders. 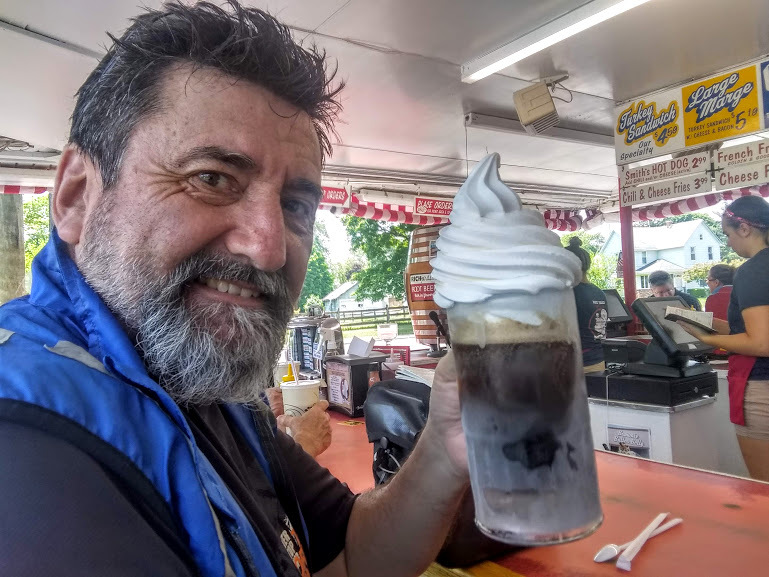 Just pour root beer into a large glass and swirl soft serve vanilla ice cream on top until you can’t add any more. It was awesome, but took me about 40mins to finish it, by then I was feeling almost ill and very bloated. 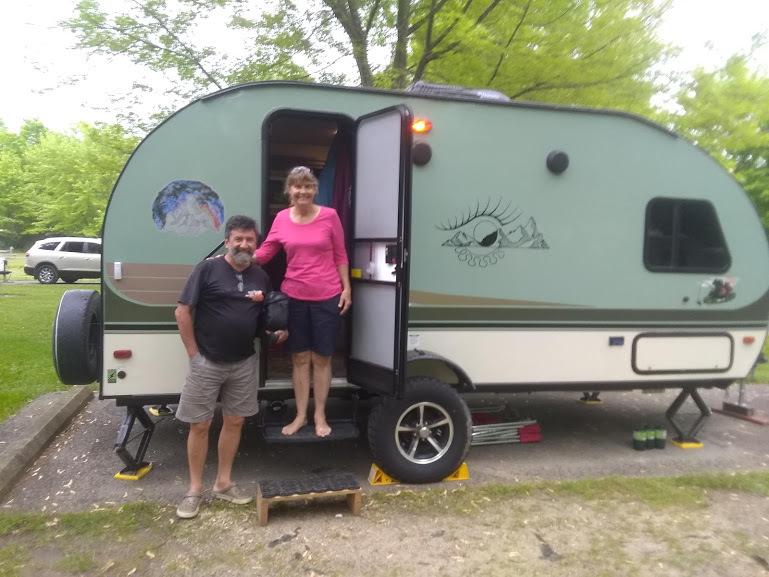 Not to worry though, we were staying just out of Conneaut at the Evergreen Village Campground, so we both had an afternoon nap once the tent was pitched. Boy, was I stuffed! A shorter ride today to Geneva On The Lake, a sort of Fairground Attraction meets Brighton Pier on the lakeshore, a genuine, family-friendly throwback to the ’50s and ’60s. We stayed at the State Park, just west of town, it was pretty nice. There’s a trail opposite that leads back into town via the marina, which is what I used to get dinner at the marina and a few beers from town. Later, a woman came over and asked us if we were riding the Northern Tier, we said we were and wondered how she knew. Jane introduced herself and told us her husband Pat, was also riding the route, but was some distance behind us. She was towing a caravan and acting as a support vehicle should he need it. Apparently, he didn’t, as he was attempting to do it unsupported, and was doing fine so far. Jane invited us over to her caravan as some light rain began to fall, and we stayed and talked for an hour or so. It was nice to spend some time with someone else and hear their stories.